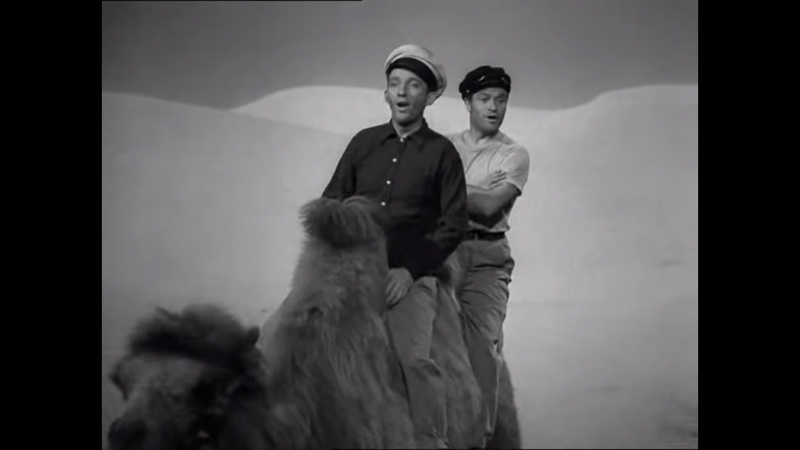 Bing Crosby and Bob Hope travel the ROAD TO MOROCCO, the third in the “Road” series and by far the funniest. 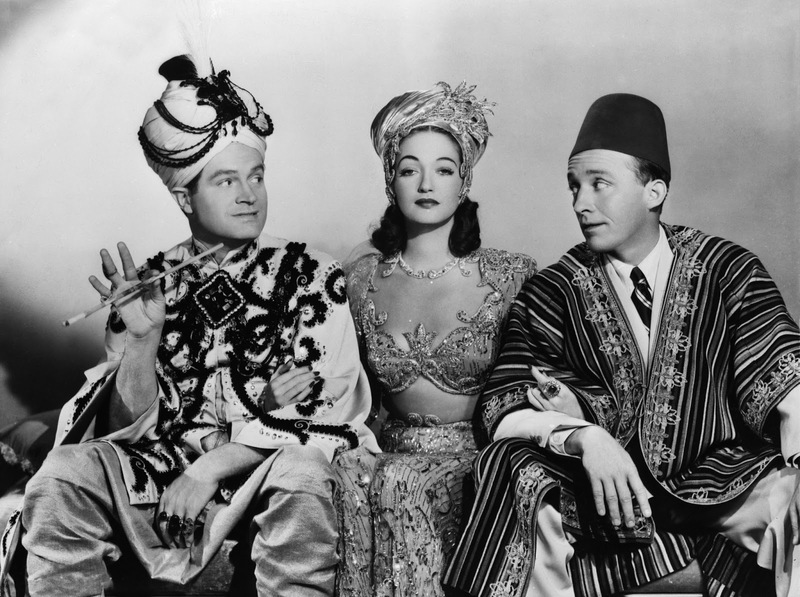 The plot involves two shipwrecked Americans who wind up in an absurd Arabian Nights style adventure complete with beautiful princess Dorothy Lamour and murderous desert sheik Anthony Quinn , but you can throw all that out the window as Bing and Bob trade quips, sing, and break down the Fourth Wall to let the audience know it’s all in good fun, so sit back and enjoy the zany ride. 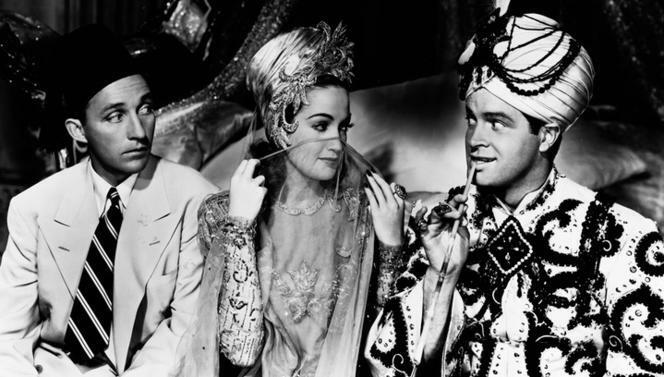 Bob and Bing were already established superstars when Paramount teamed them for ROAD TO SINGAPORE (1940), which was a huge box office hit and followed quickly by ROAD TO ZANZIBAR (1941). By the time they made MOROCCO, the pair had their act down pat, with Der Bingle the smooth-talking crooner who always gets the girl, and Ol’ Ski-Nose the cowardly wisecracker. Scripts were just a framework as the two hired their own gagsters to punch things up and ad-libbed madly, sometimes without even letting the rest of the cast and crew in on it. Their onscreen anarchy convulsed war-weary 1940’s filmgoers with laughter, as they skewered everything in their paths, including the hand that fed them, Paramount Pictures! The highlight comes when Bing and Bob attempt to rescue Lamour and handmaiden Dona Drake (who’s hot for Hope!) from Quinn’s clutches by sabotaging his party honoring a rival chieftain with whoopee cushions, a dribble glass, the old hot foot, and gunpowder-loaded cigarettes (as Crosby laces the tobacco, Hope quips “Hey, whaddaya doing, making reefers?”!! ), all while being kibbitzed by a pair of talking camels! They escape for America, and all’s well that ends well, until bungling Bob goes for a smoke in the ship’s powder room and blows it to smithereens, an excuse for Hope to crack an Oscar joke to cap the shenanigans off. From Hope playing dear, departed “Aunt Lucy” in drag to this exchange: Bob: “First, you sell me for two hundred bucks. Then I’m gonna marry the Princess, then you cut in on me. Then we’re carried off by a desert sheik. Now we’re gonna have our heads chopped off!” Bing: “I know all that”. Bob: “Yeah, but the people who came in the middle of the picture don’t”. Bing (flabbergasted): “You mean they missed my song!? 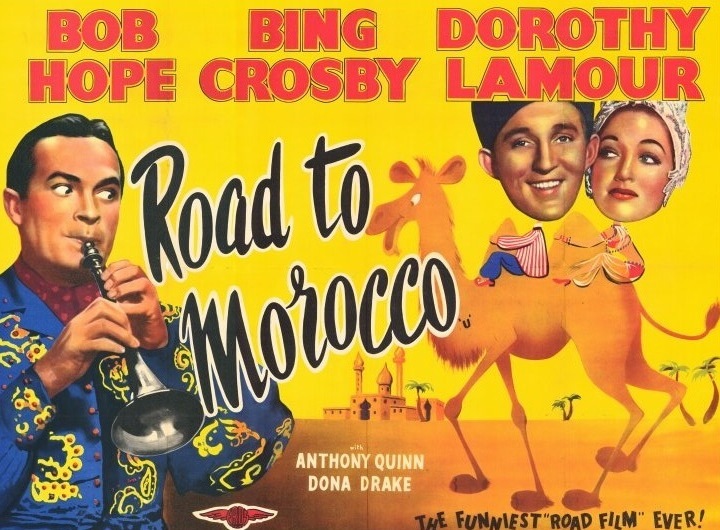 !”, ROAD TO MOROCCO is tons of foolish fun, an enjoyable romp through the desert sands with two of the 20th Century’s greatest entertainers at the top of their game. If you’ve never travelled down the ROAD with Bing and Bob, this one’s a great place to start.